The home team, Groupe Edmond de Rothschild managed to consolidate their lead of the Extreme Sailing Series Nice today, winning four of today's nine races, no doubt spurred on by the cheers of support from an estimated 27,000 strong local crowd on the Boulevard d'Anglais. Victory in Nice has elevated the French team to third place on the overall Extreme Sailing Series leaderboard going into the final event in Rio de Janeiro in December. 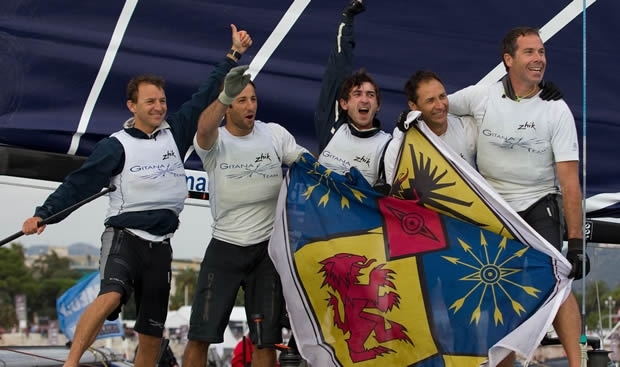 Going into the final double points race Groupe Edmond de Rothschild had to keep three boats between them and Leigh McMillan's team on The Wave, Muscat to claim victory. Tthe race was won at the start when McMillan found himself stuck in the second row. Coming off the line last, The Wave, Muscat pulled back to fourth place, but this was not enough. For Leigh McMillan, the slight disappointment to finish second and not claim his fourth win of the season was surpassed his guaranteeing his team a podium position in the 2012 Extreme Sailing Series, whatever the outcome in Rio. Oman Air came close to their objective of overhauling their Oman Sail team mates here in Nice. Earlier today they were ahead of them and the opportunity was still there when The Wave, Muscat made a poor start in the double point scoring final race. However McMillan's team fought back to finish fourth. While the frontrunners hold their own private battle for the 2012 podium, the British GAC Pindar and Danish SAP Extreme Sailing Team have their own fight developing mid-fleet with only 5.5 points separating the two teams, and the Swiss Alinghi just 5 points shy of that. With the stage now set for the final in Rio de Janeiro between the 6-9th December it is McMillan’s team who lead the overall 2012 rankings by 7.5 points and with four teams capable of a podium place, Rio de Janeiro will be a great battle!